A good business dashboard is an indispensable tool that informs with a glance. Tall Emu Dashboards allows non-technical users to create interactive, real-time dashboards in just a few minutes. Display them on a flat-screen in your sales or customer service areas, or on a smaller screen on the desks of your executives – Tall Emu Dashboards fit anywhere – including your mobile. Net invoices. Click to enlarge. You can define targets in CRM for sales using the simple user interface. Starting with a company-level target, you can drill in and set targets for individual salespeople, sales regions, categories – even individual products or accounts. We’ve made a set of dashboards which are suitable for many business types, and can easily update and configure them to suit your unique requirements. Each dashboard is interactive – clicking on one column or chart can filter the remaining charts – allowing you to use them to deeply analyse your business. 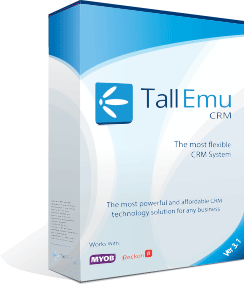 As Tall Emu CRM contains data from web, activities, quotes and sales through to payments the scope of reports possible is huge. Call Dashboard. Click image to enlarge. An executive dashboard gives you a quick, reliable indicator of your business which can alert you early to possible problems. You can see at-a-glance understanding of profitability, with views presented based on product category, customer segment or any other data that you want from Tall Emu CRM or supported accounting systems. Track information throughout the course of daily operations. Understanding the status of your production, sales process, web traffic, or other critical systems can help you anticipate and avoid problems before they bite. In Tall Emu Dashboards you can combine multiple data sources to keep track of many systems all in one dashboard.